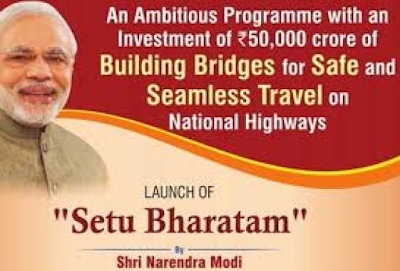 The Setu Bharatam Project, launched on 5 February by Narendra Modi, is expected to make all the national highways in India free from railway crossings. The deadline, as of now, for completing the project is 2019. With this project – as the Prime Minister says – it is clear that the government is not bothered about small steps and intends to take a quantum leap, so to speak, in infrastructural development. As has been revealed by the Prime Minister the cost of the said project has been estimated at INR 50,800 crore. As part of the project, bridges are supposed to be constructed all across India so that vehicles plying on the national highways do not get stopped because of railway tracks. Ensuring road safety is one of the major aims behind the Setu Bharatam Project. It is expected that around 208 new bridges – both under and over railway tracks – will be built and this construction will make the government poorer by Rs 100 crore for each bridge. In addition, 1500 old bridges are also supposed to be built anew and that will be more expensive at an aggregate cost of INR 30,000 crore. The 1500 bridges were mostly built during the Colonial Era. At the ceremony for unveiling the project the Indian Prime Minister marked out the difference between the approach taken by his government and that adopted by his predecessors. As per Modi, the approach taken by NDA is “integrated” and “comprehensive”, while that of the UPA was “incremental”. During the same event, he also highlighted the importance of a sound infrastructural network vis-à-vis the development and growth of the country. He said that the main reason that the central administration had taken the said approach was to bring about a qualitative change in the infrastructural development of India. According to the Prime Minister of India, the end aim in this instance is to satisfy the aspirations that common people have. He also said that his government is committed to the long-term growth of India. In the same speech he further said that this was the first time that a map of bridges in India was being put together, thus implying the absence of one during the previous regime. He also expressed surprise as to how public utility works were being done before in the absence of such information. However, he did stop short of blaming his predecessors for that instead preferring to blame the system as a whole. Modi has also stated that the government is focusing in a big way on developing roads in the rural hinterlands of India. It is also expected to take up a big slice of the pie in the union budget for 2017. Already in the 2016-17 union budget, INR 19,000 crore has been allocated for the Pradhan Mantri Gram Sadak Yojana (PMGSY). Nitin Gadkari, the Union Road Transport and Highways Minister, has also stated that work for building the bridges has already started. The government has received project reports – in detail – for 73 bridges. It is also likely that 64 other bridges will receive the green signal of the government by the end of 2016. It is expected that the aggregate cost of construction at this stage would be in the region of INR 5600 crore. Incidentally Gadkari’s ministry was also effusively praised by Modi for the “pioneering” work it had done in the domain of infrastructural development in India. The Indian Bridge Management System or IBMS is a new initiative of the Union Road Transport and Highways Ministry. As part of the programme, the central government will set up mobile inspection units whose primary responsibility will be to review the condition of the bridges in India. The government has also appointed 11 consultancy firms for the purpose. It is expected that this programme will complete its first cycle by June 2016. It is further being assumed that this will be the biggest database of its kind and will play a considerable role in easing traffic issues in India. It is also expected to create a map of all bridges in the country. As has been stated by the Prime Minister, this is also the first time that bridges in India are being graded – a significant step indeed. For this, space technology is being used along with information such as age, length, longitude, material and design, and latitude. Modi also stated that previously land acquisition could not be done for highways and expansion-based projects could not be executed as previous administrations allowed incessant encroachment with the ulterior motive of winning elections. Modi criticized the previous government saying that it only announced new trains during railway budgets with the aim of garnering praise in the parliament. The Indian Prime Minister stated quite clearly that railways cannot function on such grounds – it needed concrete development and this is where his government was focusing by way of building rail gauges and lines. Modi claimed that his administration has brought a fresh look in the railway sector and changed the ways in which the sector could be developed even further.